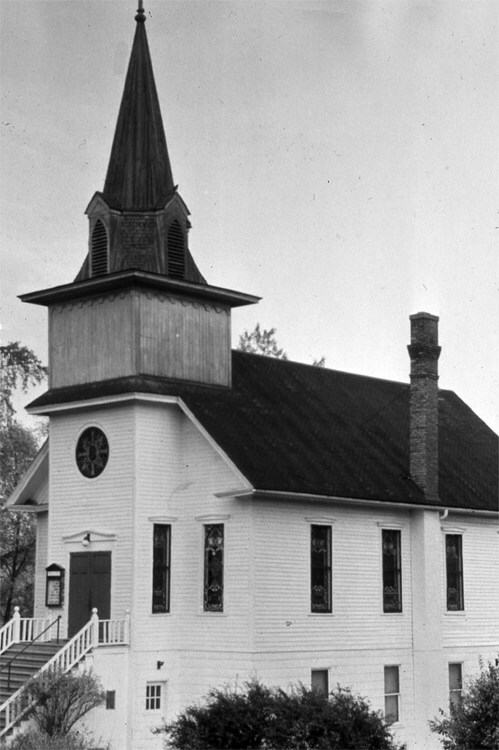 In March 1872, 25 German-born immigrants representing 14 families gathered at Duluth’s Pilgrim Congregational Church not to pray, nor to attend a Congregational service, but to organize St. Paul’s German-Evangelical Church. Trustees included H. Oswald, Charles Henning, D. Geiger, Peter Stefan, Albert Weiland, and Edward Voltzke. 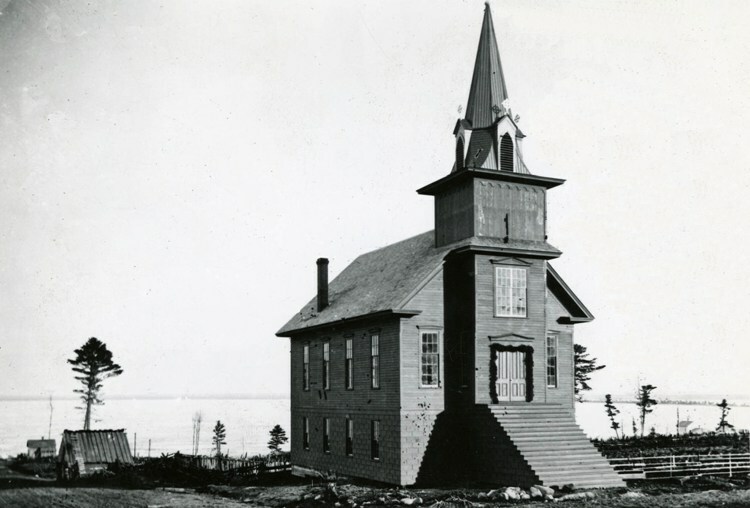 For the next 14 months the congregation used Pilgrim Congregation and Duluth’s First Presbyterian churches for services, with the Reverend John J. Lueder conducting services by July of 1872. The congregation had its own Liederkranz, a German singing society and cultural club, which sang chants and hymns in German. On special occasions the words to hymns were printed in English for non-German speakers who may have been in attendance. The church also operated a German School. By September of 1872, the congregation had purchased lots at 932 East Third Street, the “southwest” corner of Tenth Avenue East and Third Street. The Duluth Minnesotian reported that it would be the tenth church edifice in Duluth. The grand feature of the church would be its bell, a gift from German Emperor Wilhem I. Actually, Emperor Wilhelm didn’t send a bell, but rather its raw material in the form of an ornate cannon captured from the French at the surrender of Metz during the Franco-Prussian War. The cannon would be melted down in a foundry at Troy, New York, and its metal would be used to create the bell—a figurative sword beaten into a plowshare. The church itself was complete before the cannon even reached the U.S. Dedication services for St. Paul’s were held May 11, 1873. The cannon—not the bell—arrived in Duluth in June of 1874 to serve as a fundraising tool. It was put on display at Turner Hall, another German cultural stronghold. Visitors were invited to view the bell for 25 cents each, and for an additional fee received ice cream and lemonade. The money was used to pay off the building’s construction costs. The Minnesotian described the cannon as “a 6-pound brass rifled field piece, and the most beautiful piece of field artillery that we have ever seen.” It was sent back to Troy, converted into a bell, and returned to the Zenith City in August. The bell was dedicated August 23, 1874. In 1892 the building’s original double-hung windows were replaced with stained-glass. A large circular rosette window was installed above the main entrance, taking the place of a large rectangular window. Services continued in German until the 1920s, when the pastor introduced English to one service on alternating Sundays. By 1928 that model had flipped; only two services a month were then conducted in German. The choir, meanwhile, sang in both languages. In 1934 the congregation dropped the German association entirely, changing its name to St. Paul’s Evangelical Reformed Church. That was altered to St. Paul’s United Church of Christ in 1957. Two years later saw not only another name change, but a new home for the congregation as well. Using a fund it had been building since 1931, the congregation built a new church in 1959 at 1111 North 11th Avenue East and christened it Peace Church. The congregation took its historic bell with it and hung it alongside two other bells. Church leaders had asked President Eisenhower for “an instrument of war to be melted down into a second bell,” creating a parallel between the new building and the 1872 church. Instead, Ike sent a bell from the USS Ascella, a decommissioned World War II cargo ship; it arrived with officials who came to Duluth to officiate over the 1959 opening of the St. Lawrence Seaway. The congregation had a third bell made from scrap brass and copper collected locally with the help of American Legion. All three were hung in the new church’s belfry. The 1872 St. Paul’s building sat vacant until 1967, when the Church of God took up residence and stayed for ten years. In 1977 the building was converted into four apartments; the stained-glass windows and the belfry were lost, and the rosette window over the main entrance was covered. Today the building awaits whatever fate its new owners hold in store for it. For the time being it remains, representing the boom-and-bust 1870s as the oldest church building still standing in the Zenith City. And its original bell will continue to ring as long as the folks at Peace Church keep their congregation alive.